2014 Topps Dynasty Baseball is, to date, the priciest product the company has ever produced with five-card cases carrying an initial price tag of more than $1,000. As one might expect from a product that averages out to more than $200 per single-card box, Dynasty aims to tap into an ultra high-end marketplace. Every card has an autograph and is numbered to 10 or less. Autographed Patches are all signed on-card. Patch pieces are also over-sized. Basic versions are numbered to 10 while there is also a one-of-one parallel. 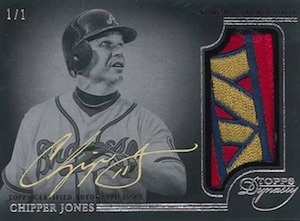 Autographed Dual Relics (#/5) all feature baseball legends. Cards are signed on-card and come with a pair of memorabilia pieces. Fifty Cut Signatures are all one-of-ones. The list of players includes all-time greats like Babe Ruth, Jackie Robinson, Lou Gehrig, Joe DiMaggio, Roberto Clemente and Ty Cobb. Finally, there are ten Cut Signature Dual Relics. Each of these pair two pieces of memorabilia with an autograph from the likes of Ruth, Clemente, Robinson and Ted Williams. Like basic Cut Signatures, each of these are a one-of-one. Cases are packed as five single-card boxes. Every card in 2014 Topps Dynasty Baseball comes encased to keep it protected. Please note that the following is a player list. Although that's complete, players have multiple cards. Topps has a history of bad high end. The design looks great but I have a feeling that plenty of these cards are going to be going for under $40 on the secondary market. Great, another Rivera card I won’t be able to add to my collection. We need some competition in this industry, and I don’t mean unlicensed product. Extremely excited to pay 299 for an Allen Webster or Jake Odorozzi auto redemption. 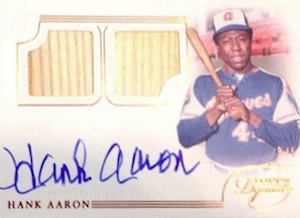 Is this the product that Topps is going to have actual players hand prints on some of the cards? Isaac � Those have been used in several products. None have been announced for this set as of yet though. At the risk of garnering some public (forum) ridicule, I must admit to just clicking “submit” to complete my purchase of a case of these–and my hands are still shaking a bit (um, I don’t usually buy products on this side of the Mendoza line). Man, I have a feeling I’m going to regret this–and then need to find a place to sleep for a couple of weeks. They will look nice, the hits will be spectacular, and the resell value will be off the charts. I expect nothing less from Topps. No room for disappointment on a product like this–they wouldn’t do that. I can’t wait. I’m getting my case for $1,600. I don’t care where the initial resale value sits, it will be nice to score some low numbered autos of legendary players. I can see this as a set I eBay search for when I’m looking to add another nice card to my collection. I’m officially quitting Topps high end products. I’ve been screwed over on Redemption cards waaaay too many times. Screw me over once same on Topps, screw me over 100x shame on me. I would have liked that there would be no rookies in a product like this, but I must say they did a good job of limiting the dud patch auto hits to under 10. I know alot of the cards will sell on ebay for under the per card price of a box, but the player checklist is stellar. Much better than any other Topps high end in years. The mock ups of the cards look great though. I wish they also had Barry Bonds in this high product. Pretty Nice. There are not many cases produced so demand may be high. Hahaha, I feel bad for the guys who paid over $300, let alone over $200 for this product. The ROI is going to be horrible, so happy I locked in a case of Bowman Draft Super Jumbo under $970. Not a good enough checklist. Was expecting more. Wacha, seriously. Come on. I ordered a box of the product before the final checklist comes out, there are some duds in the list (I’ll be extremely pissed if I pull a Taijuan Walker or Shelby Miller autograph and Ron Santo/Earl Weaver cut auto aren’t gonna be worth over $50 even if they are 1/1 as they passed away too recently). Brooks Robinson and Frank Robinson, among others should have been on the final list. Surprised on a few of the cards, on the listing especially Oscar Tavares because of his recent passing, and Mike Piazza (he never signs). Will be high-end gambling that’s for sure. correct me if im wrong but are they only producing a total of 873 cards? herb � Possible, but there could be variations of specific players. 873 would be a very small print run, even for a product that has a small print run. Wow what an awful checklist had preorder a box will now cut my losses and sell it on ebay for 40 or 50 less. Zac � Different pictures on cards so technically a different card. Normally a checklist is given as a numeric list. This one was released with just “subjects.” Some thought that meant there were just 11 copies of each player total. That’s not the case. I believe there’s 8-10 for more, each numbered to 10 with a 1/1 parallel. For example, I spotted a Randy Johnson #RJ8 last night. Hopefully we’ll have a full numeric list at some point. Does that clear things up a little? Counted only 873 total hits, and the hit potential is not bad. If I ever get the money I’ll buy one! Michael � As noted on the checklist, there are more than that. Topps has only released a player list for the bulk of it. Most players have more than one version, each numbered to 10. I have noticed 5 variation cards of Don Mattingly on eBay. One card? My Gd! What’s next, open a box and maaaaaybe you get a card, maybe just an empty box … because every box is a mystery? “The most carefully curated checklist in trading card history” has some deficiencies. For $300 per card, I can snag some very nice issues of Adrian Gonzalez, Josh Hamilton, Nick Castellanos, Shelby Miller, Tai Walker, Hanley and Longoria, amongst others, for a 1/3 of this box price. And as a brief aside, and while he was extremely gifted, if I dropped a troika of Benjamins on this product and my ONLY card was Oscar Taveras? I’d be seething. Perhaps use those cards as inserts in a future product, but pushing them off on consumers who are expecting at least the opportunity for the ROI is patently unfair. There is NOT only 873 total cards..
hearing 2400 cases…. but if anyone here hears anything else..please pipe in..
Bought a box for 350, pulled a Puig 1 of 1….then saw on ebay they made a variation 1 of 1 Puig. Rip off. Other 1 of 1, PATCH dirty GOLD AUTO. This product will sell out and produce money for Topps which is why they exist and allows us to have any Topps product to buy. Those who actually have the money and can afford to buy won’t regret it. Cost is relative to them. Those who don’t have the money but buy anyway are gambling when they should be more financially prudent. They will then whine and of course regret it when they don’t get the big hit, as though they didn’t have a clue this could happen. Smart money buys on the secondary market but all the more reason to appreciate those who take the risk, minus the whining. Terrible return on investment. There are several photo variations of each card. Saw 2 – 5/10 of same player. I pulled a Mike Trout and Ryne Sandberg and still lost money! HORRIBLE! Even the Ripken autos in this product won’t bring you single box msrp! Topps is at the peak of its’ monopoly! What a disappointment! Averaging $300 per card (box), there is NOTHING special about this product. The same old tired patch pieces with autographs to the side on the card. Is the slabbing really worth THAT MUCH MORE? I am done with this nonsense! Worst product ever. They over priced it and I for one will never buy another high end series. Overall Impression – lost a ton of money. That’s actually not bad Brook, I would expect a bigger loss…. The 1 star is for carefully curated scam. Intentionally misleading people by disclosing the player list, card production run (#/10 & 1/1) and NOT disclosing the full set list or amount of cases is a sham. People can debate the players, the quality of card, etc… IMO they are the best patch cards ever from Topps. The bottom line is Topps did this as a strategy to mislead the scarcity of the product. IMO that’s a lot worse than not disclosing a checklist to due to lesser players being included in the product. I do not understand why Topps is required to post the odds of pulling cards on certain products and not all? To me this is the equivalent to a food manufacturer giving false ingredients and calorie count on their products. The biggest loss went to the initial buyers on Ebay. People paid 4x or more the first couple of days for certain players. Once blogs starting figuring out the true number of printed cards the price plummeted. At least Topps threw in the redemption as a bonus rather than the one $300 redemption card. Redemptions as a bonus should be the norm, it should never count as the guaranteed hit. 1 star for the photo vacations (12) 1/1 and (12) #/10 for “each players card #’d to just 10” . Add this to the long list of poor business practices of the Topps dynasty. Ok, this review section is nothing but whining. Seriously, folks! These are EXPENSIVE cards. If you can afford to purchase the cards, then great. You have a decent amount of disposable income for a HOBBY. If you are investing in this product just to immediately sell for a loss and are whining about i and feel like you’ve been burned, that’s your own damned fault. Invest your money smarter next time. Like in a 401(k) or an IRA, or a Roth IRA. Maybe purchase some property like a house that is a fixer-upper. Hell, wright up a business plan and approach a bank for a loan to start your own business; (a VERY risk proposition, btw!). Baseball cards as an investment is a JOKE. It always has been, and always will be. Even at the peak of the industry in the 80s, it was still a joke. Same with stamps and coins. Any hobby. It is NOT an investment. It is a hobby. You WILL get burned, that I guarantee. Plus, what if your house catches fire, god forbid? So, lemme get this straight. Brook bought 5….FIVE…$300 boxes, just to immediately put up on eBay. I mean, COME ON, for crissakes! Heck are you thinking!? If you have $1500 in disposable income like that, it has to be a hobby you enjoy! $1500 to me might as well be a million. That’s why i stick with low-end products where I will pick up a pack or two of a few bucks. I like to open them up, look at what I got, enjoy the artwork and photography, and put them in an album. Buying another pack or two will give me the excuse to open up the album and look through them again as I resort and reorganize the cards. If I had $1500 to burn, I would 5 boxes of these and do the same thing. And finally, the first 4 reviews gave a single star, based on PAST experience. NOT based on THIS PRODUCT! Seriously!? Ugh.